The Inside Out/ Dreamers Project installation on Friendly Ave is just one installment of an international art project by French artist JR. 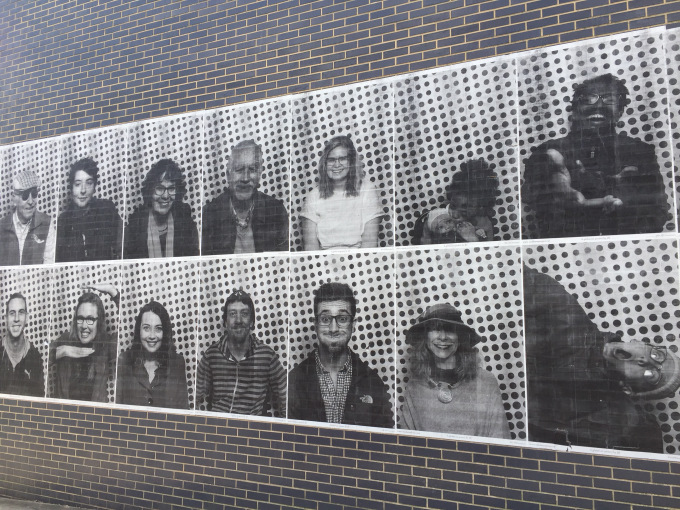 There are portrait installations like this one in cities around the world and each one invites locals from marginalized communities to participate and tell their stories. Many of the Inside Out Project installations in the United States, like this one in Greensboro, celebrate immigrant voices. The project leaders invited immigrants and descendants of immigrants in Greensboro to come down and get their portrait taken to be featured on the wall. The art project’s purpose is to “remind us that behind the policies are real human stories that are deeply rooted in the story of this country,” www.insideoutproject.net/dreamers.